Ring make overs have been our most recent and exciting topic of discussion. There is so much that goes into custom designed rings using your favorite materials. Rose gold happens to be one of our favorite choices but as you know the traditional engagement could never be limited to a specific idea. This is the beauty of custom design! The goal is to make your vision come to life. If there is diamonds that have been passed down through generations in your family do not hesitate to use them in the process of designing your own engagement ring. Using cherished diamonds with history will make your ring much more valuable! Here are a few styling ideas for antique ring make overs. If you notice the diamond center on these pieces is the main attraction. An elegant and simple choice for a vintage diamond is to create a halo setting so that the diamond center can stand out. You can choose as many excess diamonds as you want to decorate the surrounding area of the center stone. It is understandable as to why most of us would hesitate before taking apart an antique ring that has been in our family for years. Pieces like this hold many memories and value, however you are reinventing your roots through diamonds and custom design. Rings that have lasted over 15 years are bound to become extremely fragile with a base that no longer has the ability to hold center diamonds together. 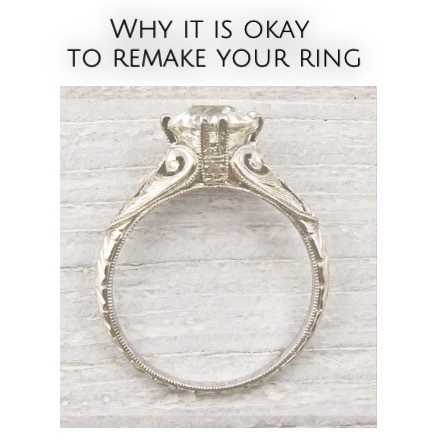 Changing the gold in the ring and keeping the diamonds is simply getting rid of the excess and creating a sturdy setting to give those gorgeous aged diamonds life again. This is all about perspective, if you consider your options of extending cherished gems in your family then get creative. Start by looking through setting styles and ring designs to see how you can reset those diamonds. Your ideas would revolve around the type of diamond cut you are working with. If there is several diamonds included in your antique ring then designing a three stone setting is also an option. Have fun with this and find ring designs that fit your personality and style. These emeralds and antique vintage looking rings are also remakes. You can keep the vintage looks and just renew the gold. Feel free to sketch out an idea you have and your head and begin the design process from there. The CAD design for a ring is computerized and able to pick up unique shapes and edges you would like to include. Click any of the images on this blog to get some insight on how we go about the custom design process. NEED Styling Ideas ----> Follow LeZari's social media we post new diamonds and styles daily!